This article is about the American sitcom. For other uses, see Family Matters (disambiguation). The series originally focused on the character of police officer Carl Winslow and his family: wife Harriette, son Eddie, elder daughter Laura, and younger daughter Judy (who appeared until the character was written out in season four). In the pilot episode, "The Mama Who Came to Dinner," the family had also opened their home to Carl's street-wise mother, Estelle (Rosetta LeNoire), usually known as "Mother Winslow." Prior to the start of the series, Harriette's sister, Rachel Crawford and her infant son, Richie, had moved into the Winslow household after the death of Rachel's husband. The Winslows' nerdy teenage next-door neighbor, Steve Urkel (Jaleel White), was introduced midway through the first season in the episode "Laura's First Date" and quickly became the focus of the show. The popular sitcom was a mainstay of ABC's TGIF lineup from 1989 until 1997, at which point it became part of the CBS Block Party lineup for its final season. Family Matters was produced by Bickley-Warren Productions (1991–1998) and Miller-Boyett Productions, in association with Lorimar Television (1989–1993) and later Warner Bros. Television (1993–1998). As the show progressed, episodes began to center increasingly on Steve Urkel, and other original characters also played by White, including Steve's suave alter-ego, Stefan Urquelle, and his female cousin, Myrtle Urkel. In early 1997, CBS picked up Family Matters and Step by Step in a $40 million deal to acquire the rights to the programs from ABC. ABC then promised to pay Miller-Boyett Productions $1.5 million per episode for a ninth and tenth season of Family Matters. However, tensions had risen between Miller-Boyett Productions and ABC's corporate parent, The Walt Disney Company (which had bought the network in 1995 as part of its merger with ABC's then-parent Capital Cities/ABC, Inc.). Miller-Boyett thought that it would not be a big player on ABC after the network's recent purchase by Disney. In turn, Miller-Boyett Productions agreed to a $40 million offer from CBS for a 22-episode season for both Family Matters and Step By Step (along with a new production from the company, Meego). CBS scheduled Family Matters along with Meego and Step By Step as a part of its new Friday lineup branded as the CBS Block Party and scheduled the family-oriented block against ABC's TGIF lineup, where the two series originated. Although Jo Marie Payton was reluctant to continue and wanted to leave, feeling the show had jumped the shark years prior, she agreed to stay for the first half of the season to keep continuity and, partway through, her part was recast with Judyann Elder. Family Matters, while it continued to lose viewership compared to previous years, was initially a modest success on CBS, beating the show that replaced it, You Wish. Meego, however, was a ratings failure and was canceled after six weeks. Near the end of the ninth season, the cast was informed that a tenth and final season was planned, so scripts and plot synopses were written for the show. After the holiday special season, CBS replaced Meego with Kids Say the Darndest Things, and with that show's child-centered focus, it was placed in Family Matters's 8/7c time slot, with Family Matters pushed an hour later and paired with Step by Step. The ratings for Family Matters fell even further in this later slot, and the entire Block Party except for Kids Say... was canceled in spring 1998, with the remaining episodes burned off in the summer. ^ a b Jo Marie Payton made her last appearance in "Deck the Malls" (season 9, episode 11). Judyann Elder assumed the role of Harriette Winslow for the remainder of the season, beginning with "Crazy for You (Part 1)" (season 9, episode 14). ^ The character was first portrayed by Valerie Jones in the pilot episode ("The Mama Who Came to Dinner"). Jaimee Foxworth assumed the role thereafter. ^ In the original run of the show, the character of Steve Urkel debuted in episode 1.12 "Laura's First Date", and appeared in every episode thereafter. For all re-runs, new Urkel-focused cold openings were written and shot for several episodes starting with 1.4 ("Rachel's First Date"), and including 1.7, 1.8 and 1.10. Family Matters was created by William Bickley and Michael Warren (who also wrote for, and were producers of parent series Perfect Strangers) and developed by Thomas L. Miller and Robert L. Boyett (who also served as producers on Perfect Strangers), all four also served as executive producers of the series. The series was produced by Miller-Boyett Productions, in association with Lorimar Television who co-produced the show until 1993, when Warner Bros. Television absorbed Lorimar (a sister company under the co-ownership of Time Warner). Starting with season three, the series was also produced by Bickley-Warren Productions. The series was filmed in front of a live studio audience; the Lorimar-produced episodes were shot at Lorimar Studios (later Sony Pictures Studios) in Culver City, California, while the Warner Bros.-produced episodes were filmed at Warner Bros. Studios in nearby Burbank. Family Matters is the second sitcom from the 80's and 90's to take place in the city of Chicago, the first is FOX's sitcom Married... with Children. Also, Family Matters aired from 1989 to 1998, along with Seinfeld. The show's original theme was Louis Armstrong's "What a Wonderful World"; it was scrapped after the fifth episode of season one ("Straight A's"), though it was heard only in the pilot episode in syndicated reruns. The second theme, "As Days Go By," written by Jesse Frederick, Bennett Salvay and Scott Roeme and performed by Frederick, was the theme for the majority of the series until 1995; it was last used in the season seven episode "Fa La La La Laagghh," the only episode during the final three seasons to feature it (this was heard in season one episodes in ABC Family and syndicated airings). A longer version of "As Days Go By" was used during the first three seasons, though in syndicated reruns the short version is heard (in ABC Family airings, the long theme was used for all of the episodes during the first three seasons). 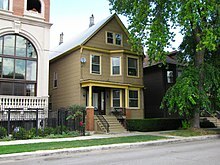 The Family Matters house in Chicago (depicted as the Winslow family home) in 2010. The house has since been demolished and replaced with a new building containing condos. In addition, the structure to the left did not exist at the time the show's exterior shots were filmed. The opening sequence begins with a shot of the Chicago Lakefront (the John Hancock Center can be seen in the center), then a shot of the Winslow home. In the opening titles, the main characters were shown around the Winslow home (though in some shots featured some characters in other places as well, such as Rachel at the Rachel's Place restaurant during the seasons 2–4 version or Waldo at the Vanderbilt High School gym during the seasons 4–6 version). The opening credits during the first three seasons feature a scene showing the Winslow family riding their bicycles across the Irv Kupcinet Bridge over the Chicago River; an allusion to parent series Perfect Strangers, which featured a scene of Balki and Larry (played by Bronson Pinchot and Mark Linn-Baker), riding a tour boat underneath the same bridge, shot from the same angle, in its own opening credits from seasons 3–8 of that series. Clips of episodes were shown after the bike scene and before the house shot in the season one through three versions. The house shown at the beginning and the end of the opening credits (as well as in establishing shots for scenes set at the Winslow house) was located at 1516 West Wrightwood Avenue in Chicago (41°55′44″N 87°40′00″W﻿ / ﻿41.92891°N 87.666779°W﻿ / 41.92891; -87.666779) until it was demolished to build a new condo housing facility. The closing shot at the end of the credits with the Winslow family at the piano (which also was shown during the closing credits when there was no tag scene), in which the shot pans outside the house and the camera zooms out showing neighborhoods and the northside Chicago skyline (Wrigleyville) in the background, was originally used in the pilot episode "The Mama Who Came to Dinner" (though the scene featuring the Winslows before the pan was redone twice in seasons two and five). The role of Richie as a baby was credited as being played by "Joseph [and] Julius Wright" in season 1, with Julius' name made to appear as Joseph's middle name in the titles—the duo was credited this way because the show's producers did not want audiences to know that Richie was then played by twins—the role of Richie as a baby was played by two children because California state law regulates the number of work hours for a young child, therefore it is common for the role of one baby in a television or film production to be played by twins (another Miller-Boyett series, Full House, credited Mary-Kate & Ashley Olsen in the same manner in its opening sequences until that show's seventh season, in which the Olsen twins were credited separately). In season five, after Hopkins left the show, White was given special billing in response to the popularity he earned as Steve Urkel. Appearing last in the credits, he was credited as "and Jaleel White as Steve Urkel," starting in the sixth season (Hopkins was credited similarly as "and Telma Hopkins as Rachel" prior to season five). For season seven onwards, the opening theme song and credit sequence were dropped entirely (though it was brought back for one episode, "Fa La La La Laagghh," the eleventh episode of that same season); for all other episodes during the last three seasons, the names of the show's main cast members, as well as co-executive producers and executive producers were shown during each episode's teaser scene. In lieu of the full theme song, several episodes during season 7 featured the last few notes of “As Days Go By” as fade-out music at the end of the opening scene. Perfect Strangers—Before Family Matters, Harriette Winslow was originally the elevator operator at the Chicago Chronicle newspaper office in the third and fourth seasons of Perfect Strangers. Family Matters was a spin-off series given to this character in 1989. In the second episode of Family Matters, Harriette was fired as elevator operator at the Chronicle, but was soon re-hired as "Chief of Security," which explained her absence from dealings with the Perfect Strangers cast. Full House—In the season 4 Full House episode "Stephanie Gets Framed," Urkel helps Stephanie Tanner (Jodie Sweetin) deal with her anxiety after she finds out she has to wear eyeglasses because her vision is fading. Step by Step—In the original ABC broadcast, the ending gag of Family Matters' third season episode "Brains Over Brawn" is crossed over with the opening of the second episode of Step By Step, "The Dance." Urkel's jet-propelled flight pack causes him to fly through the Winslows' roof as one show ends and crash-land in Port Washington, Wisconsin, where the Lambert-Foster family is enjoying a barbecue as the other show opens. Urkel goes on to help his science-fair pen pal, Mark Foster (Christopher Castile) and lifts Alicia "Al" Lambert's (Christine Lakin) spirits after her potential date dumps her just before a school dance. He reprises his "Do the Urkel" dance in the scene where Al gives the guy who dumped her his comeuppance. Urkel also makes a brief cameo in the 1997 episode "A Star Is Born," snapping a clapperboard on the set of the movie that Al was cast in over her two sisters. Meego—In this short-lived series, Steve makes a non-speaking cameo appearance in the second episode "Love and Money" where he angrily retrieves a television set stolen by Meego. He then appears in the third episode "The Truth About Cats and Dogs" helping out at a model car derby competition. In September 1993, Warner Bros. Domestic Television Distribution began distributing Family Matters for broadcast in off-network syndication; most television stations stopped carrying the show by around 2002, though some stations in larger markets such as WTOG in Tampa, Florida continued to air Family Matters until as recently as 2005 and WPIX as 2007. In 1995, reruns of the series began airing on TBS Superstation, where it ran until 2003. From 1997 to 2003, reruns of the series aired on WGN America. In 2003, ABC Family picked up the series and aired it for five years until February 29, 2008. From 2004 to 2006, UPN aired the show for 2 years. BET aired reruns briefly in December 2009 and began airing the series on a regular basis on March 1, 2013. MTV2 also began airing reruns on September 7, 2013. The show aired on Nick at Nite from June 29, 2008 to December 31, 2012. ABC Family and Nick at Nite airings cut the tag scenes at the end of all episodes, despite the fact that many episodes during the series have tag scenes during the closing credits. In 2015, the series now airs on a Viacom owned cable network BET Her. In Canada, the series also aired on CTV and CBC for reruns. On September 29, 2017, Family Matters became available for streaming on Hulu along with fellow Warner Bros. TV productions Full House, Hangin' with Mr. Cooper, Perfect Strangers and Step by Step in addition to Disney-ABC TV productions Boy Meets World, Dinosaurs and Home Improvement. Warner Home Video has released the first four seasons of Family Matters on DVD in Region 1 while the remaining five seasons were released by the Warner Archive Collection. On February 4, 2014, Warner Home Video released season 4 on DVD, but consumers complained when it was found that the season 4 set contained syndication edits rather than the original broadcast masters. Warner Bros. responded to the complaints, offered a replacement program to receive corrected discs and reissuing the set with corrected broadcast copies on April 4. All episodes are the original broadcast form, except for the episode "Number One With a Bullet", disc 1, episode 6. The entire series is also available for digital download on Amazon.com and the iTunes Store, all but season 6 remastered in both SD and HD. WatchMojo.com rated Family Matters as the #8 African American TV show. Steve Urkel was rated as the #2 most annoying TV character and as the #4 TV neighbor. His catchphrase Did I do that? was rated as the #10 sitcom catchphrase. A 2014 episode of the Comedy Central sketch comedy program Key & Peele featured a sketch about how the Steve Urkel character took over Family Matters, and how that change affected others involved in show. The website Funny or Die featured a 2014 April Fool's skit in which Reginald VelJohnson tried to crowdfund a Family Matters movie, which would cross over with the film series Taken. Steve Urkel will appear in Scooby-Doo and Guess Who?. There is an episode of The Lucas Bros Moving Co. Revolved around the idea of bring Family Matters back. ^ Fearn-Banks, Kathleen (2006). Historical Dictionary of African-American Television. 7. Rowman & Littlefield. p. 135. ISBN 0-8108-5335-3. ^ Fisherkeller, JoEllen (2002). Growing Up With Television: Everyday Learning Among Young Adolescents. Temple University Press. p. 178. ISBN 1-56639-953-X. ^ Haithman, Diane (January 4, 1991). "Is Uncool Urkel the '90s Answer to the Fonz?". Los Angeles Times. Retrieved October 18, 2012. ^ Bellafante, Ginia (December 9, 1996). "Revenge of The Nerd". Time. Time.com. Retrieved October 18, 2012. ^ Boedeker, Hal (July 18, 1997). "He's A Goober But CBS Has A Lot Riding On Urkel TV". Orlando Sentinel. Retrieved October 18, 2012. ^ Brooks, Tim; Marsh, Earle (2007). The Complete Directory to Prime Time Network and Cable TV Shows 1946-Present (Ninth Edition). Ballantine Books. pp. 1692–1693. ISBN 978-0-345-49773-4. ^ a b "Family Matters DVD news:Announcement for Family Matters – The Complete First Season". Archived from the original on November 4, 2012. Retrieved January 13, 2013. ^ a b "Family Matters DVD news:Announcement for Family Matters – The Complete Second Season". Archived from the original on March 17, 2013. Retrieved January 13, 2013. ^ a b "Family Matters DVD news:Announcement for Family Matters – The Complete Third Season". Archived from the original on January 6, 2013. Retrieved January 13, 2013. 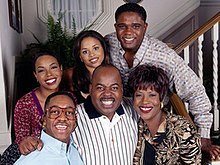 ^ a b "Family Matters: The complete Fourth Season Season". Archived from the original on December 27, 2015. ^ a b "Family Matters – EXCLSUVE! Release Date for 'The Complete 5th Season DVD". Archived from the original on December 27, 2015. Retrieved December 27, 2015. ^ "Family Matters – Warner Archive Gives Us the CORRECT Word About 'The Complete 6th Season' DVDs". Archived from the original on March 17, 2016. Retrieved April 15, 2015. ^ "Uncensored – Key & Peele – Family Matters". YouTube. Comedy Central. Retrieved October 10, 2014.